There’s an app for that! What was once a witty slogan is now truer than ever before. We have endless options for apps that help us organize our lives, keep track of our workouts, and much more. For many of us, technology eases life planning and connects us to the resources we need to make life a little easier. For foster youth and families, technology can play a vital role to better address their care and support needs—and we are heading in the right direction. In May 2016, the White House hosted the first-ever Foster Care & Technology Hackathon, ushering in a new era for foster care. Organized by the Pritzker Foster Care Initiative, the US Department of Health and Human Services, and Think of Us, the Hackathon was an opportunity to leverage technology to identify ways to improve health, education, and economic outcomes for youth and families in foster care. Hackathons, as a model, welcome ideas and solutions from the technology sector to previously identified challenges in the child welfare system and invite foster youth and families to weigh in on those ideas and solutions. The events bring together a mix of people—from child welfare experts to software developers, technology leaders to foster youth or foster care alumni—with diverse skills and perspectives, who stimulate one another’s creativity, cross-pollinate ideas, and develop concrete prototypes or proposals that address challenges posed to the group. In doing so, a new partnership between technology and child welfare emerges to tackle real life challenges impacting the lives of children and youth in foster care. The White House event also inspired further hackathons, including one that will take place next week in Silicon Valley (Feb. 27-28). The Silicon Valley Foster Care Summit will put its unique stamp on this opportunity, with the involvement of a broad set of major technology firms and commitments from partners to provide laptops and tech internship opportunities for foster youth in the community. The Summit—organized by the Silicon Valley Children’s Fund, TeenForce, and Think of Us, and sponsored by the Walter S. Johnson Foundation and others—promises to build on the momentum to make lasting change for children and youth in foster care. The Children’s Partnership is proud to join our partners at the Silicon Valley hackathon and bring our ten years of experience working on health information technology solutions to improve care and services for children and youth in foster care. Thanks to the infusion of energy and new ideas fostered by the hackathons, these efforts are gaining traction in child welfare. California’s hackathons are tackling head on the need to improve access to laptops, smart phones and low-cost broadband access for foster youth and their caregivers, while simultaneously developing apps and systems for their use. The time is right in California to leverage technology to support the transformation of child welfare services through the Continuum of Care Reform and to enhance the impact of the Child Welfare Services case management system that is being designed and developed right now. In these and other initiatives, digital tools and features can be deployed to improve care coordination, engage foster parents more effectively, and empower foster youth themselves. Hackathons, like the one taking place next week in Silicon Valley and one being planned for Los Angeles at the end of April, are an important building block in the evolution of child welfare services. However, the work cannot stop after the events and those of us tackling these issues must share resources and lessons learned to ensure the best results. As partners in the fight to support children and youth in foster care, child welfare advocates, community organizations, technology companies, child welfare agencies, and foster youth themselves must continue the collaboration and press forward to realize the value of this opportunity. Tomorrow, The Children’s Partnership will present at the first ever White House Foster Care and Technology Hackathon—an event organized by the Pritzker Family Foundation, the White House, the US Department of Health and Human Services, and Think of US, a nonprofit that promotes technology innovations to better support foster youth. The two-day event during National Foster Care Month brings together programmers and tech experts alongside individuals from the child welfare, legal, and nonprofit sectors to explore how technology innovation can improve outcomes for families and youth who experience foster care. Improvements to our foster care system through the use of technology will be the focus of panel discussions and speakers. Additionally, those connected with the child welfare system will have the opportunity to team up with technology experts to “hack” real world challenges that foster care youth, families, and child welfare workers face. TCP is proud to join this important event and bring our 10 years of experience working on health information technology solutions for foster care to the discussion. Mounting evidence shows that on a number of outcome measures—including college graduation, employment, housing stability, dependence on public assistance, and incarceration—former foster youth often struggle well into adulthood. Just half of the 400,000 children in the US foster care system will complete high school by age 18. This trajectory needs to change. In our latest issue brief, titled “Engaging Foster Youth and Foster Parents in Electronic Records Initiatives: Lessons Learned,” we highlight important projects across the country that will help inform the collective brainstorm around solutions at the White House Hackathon event. As our new brief notes, electronic records initiatives can help knit together a care team, make sure that care decisions are informed by critical data, and offer youth a voice in their own care by equipping them with their own life records. The White House event, a convening of some of the brightest minds in the field, will begin to address these issues on the national stage by creatively considering new solutions to the obstacles that prevent children and youth in foster care from achieving their full potential. We are honored to be a part of that conversation. What Can California Do to Prevent the #1 Chronic Childhood Disease? During February, we commemorate Children’s Dental Health Month and, in doing so, reflect on the state of oral health for kids in California and what needs to be done to improve it. Tooth decay is the number one childhood chronic disease—two to three times more common than childhood obesity or asthma. Yet it is preventable. Here is some work The Children’s Partnership is doing to promote solutions to the problem. Helping families understand their dental benefits and how to use them. Many families in California may not know that if their child is enrolled in health coverage through Medi-Cal or Covered California, he or she also has dental coverage. Schools, businesses, doctors, nurses, and communities all have a role to play in helping families understand how to get the dental care their children need. That’s why we created brand new flyers to help families navigate dental coverage for their children. It will be especially important to educate families whose children may not have had coverage in the past, such as low-income undocumented children who will be newly eligible for Medi-Cal later this year. We will be sharing these flyers through schools, clinics, and other partners. Please help us get them out to families, too! Bringing dental care to children where they are in the community. Underserved children, who suffer from poor oral health, face significant obstacles in obtaining dental services. Many low-income families have difficulty getting needed dental services because they lack affordable transportation, lose pay when they miss work, and face other socioeconomic barriers. Bringing care directly to them bypasses these barriers and, for many, may be the only option for getting care. The Virtual Dental Home (VDH) is an innovative and cost-effective system for providing dental care to California’s most vulnerable children in community settings. The VDH model uses technology to connect specially trained dental hygienists and assistants, located at community sites (such as schools and Head Start sites), with dentists in offices or clinics to facilitate comprehensive dental care. We are sponsoring legislation—AB 648 (Low)—which would provide a one-time start-up investment in training, equipment, technical assistance, and other support that providers need to begin implementing the VDH so that it can be brought to underserved communities across the state. Encouraging a sustainable system of care for children in Medi-Cal. Now that more kids than ever have health and dental coverage, we need to make sure they can use it. Approximately 5.6 million California children are enrolled in Medi-Cal, but fewer than half of these children are receiving necessary dental care. While progress has been made, Medi-Cal continues to fall short of meeting the dental care needs of the state’s most vulnerable children. We need a sustainable system that brings care to children in community settings, utilizes community health workers to educate and engage families and coordinate care, and provides enough dentists in the right places to address the restorative dental care needs of children. For example, the State should implement a program like the ABCD program in Washington State and a similar program in Alameda County that supports a whole team to address the oral health needs of young children. Shaping the State’s oral health plan. This year, TCP is helping to develop the State Department of Public Health’s statewide oral health plan, led by the newly appointed Dental Director, to ensure the plan makes meaningful recommendations for improving children’s oral health and action is taken to begin timely implementation. All of California’s kids deserve the dental care they need to not suffer in pain, do well in school, and avoid costly health problems later on in life. Please join us in helping families understand their children’s dental coverage and how to get care by promoting these much-needed statewide systems. Contact Jenny Kattlove, Senior Director of Programs, with any questions at jkattlove@childrenspartnership.org. As the new President of a dynamic and innovative children’s advocacy organization, I am constantly learning—from community members, partners in the field, policymakers, my staff, and many others. At TCP, it is our organization-wide commitment to learning that informs our work to better meet our primary goals of ensuring all children have access to quality, affordable health care and reap the benefits of digital opportunities. To learn more about our work, I invite you to take a look at our recently released California and Federal Policy Agendas, where we as an organization have the chance to make good on our mission to improve the health and well-being of children in the Golden State and across the nation. These agendas reflect how what we are learning influences our work as we continue to evolve with the changing political and social landscape for children. In 2016, we will build upon TCP’s two-plus decades of work to continue securing key advances for children across the nation. I’m excited to work with our partners to ensure that all children have quality health coverage that meets their needs. This includes continued work in California to make certain that children’s voices are heard as the implementation of the Affordable Care Act moves forward, as well as in the implementation of the recent extension of Medi-Cal to all-low income children, regardless of immigration status, and in the work of refining processes to make obtaining coverage as seamless as possible for every family that qualifies. Nationally, we will continue to advocate so that the crucial and bipartisan Children’s Health Insurance Program’s success in providing affordable, child-specific, and comprehensive coverage continues. For this work and more, we recognize the importance of reaching families in their communities as key to a successful outreach effort to ensure newly eligible children and families enroll in health coverage and access preventive care. From community-based organizations to government agencies to private companies, we will continue to partner with diverse organizations to make sure families have the information they need to access health coverage and care. Our ALL IN For Health Campaign has already delivered 7.3 million messages to families encouraging them to enroll in affordable health coverage, thanks to the help of partners in the education community. In the coming year, we will deliver even more messages with the help of our partners. We will also continue promoting the smart use of technology to improve the quality of care received by our most vulnerable children and to empower families to take control of their children’s health. And we will keep pushing to ensure that the 5.5 million California children enrolled in Medi-Cal receive the dental care they deserve—especially considering that dental care is the number one unmet chronic health care need for children. When I took the helm of The Children’s Partnership late last year, I brought with me my personal and professional mission of ensuring families are healthy and able to pursue their dreams. I am excited to learn from families in California about how our work moving forward can better meet their needs. These policy agendas reflect what our team has heard and represent our next step toward making that mission a reality. We hope you will take the time to read them and learn a bit more about TCP and our work this upcoming year. Read our California and Federal Policy Agendas for 2016. We’ve all had the experience of misplacing an insurance card or losing a child’s immunization record. Such documents always seem to go missing right when we need them—say, when a child must enroll in school or when we require medical care. Hard copies of important documents are easy to lose track of, particularly when life circumstances require a move or change in living arrangements, as is often the case for youth in foster care. These frequent disruptions lead to fragmented health care and disorganized, incomplete, and outdated life records. Safe, online storage of critical personal documents would be especially helpful to older foster youth when they are transitioning out of foster care to more independent living arrangements and assuming responsibility for their own needs. Equipping these transition age youth with an “electronic backpack” for critical documents could help ensure that they have their own records and personal histories available when they seek employment, housing, and educational opportunities as young adults. Such a tool could also free up time for busy caseworkers who would be able to spend less time chasing down missing documents and records and more time offering meaningful support. A new issue brief from The Children’s Partnership describes how counties in California can integrate this type of tool into existing processes and requirements under AB 12—a law that extends welfare benefits and services to foster youth in California up to the age of 21 if they choose to remain in the program past their 18th birthday. Agencies interested in empowering youth with their own critical life documents can follow the roadmap included in the brief, which identifies optimal opportunities for integrating an electronic record system into the emancipation process. This innovative and streamlined approach will help ensure that youth entering extended foster care are empowered with the critical life documents and records they need to thrive as independent adults. Read the new issue brief: Supporting Counties in Transitioning Foster Youth to Independence Under AB 12: How Electronic Record Systems Can Help. Learn more about why electronic records matter for children and youth in foster care. Ventura County Foster Health Link Goes Live! California is a crucible of innovation and creativity, where new technologies are rapidly transforming health care. In particular, the explosion of digital health tools is spurring a cultural shift in the way that individuals manage their health and well-being, allowing for a more active role, such as the ability to track one’s own health status and use data to guide personal decisions. But how do we ensure that all Californians benefit from this progress? Ventura County is tackling this problem with a forward-thinking approach to improving outcomes for a population that is often left behind by technology innovations—children and youth in foster care. Last week, the County launched Foster Health Link (FHL), an electronic record for foster parents that includes key health and education information about the kids in their care. Foster Health Link will improve continuity of care for foster youth and their caregivers by moving records from a disorganized and impermanent paper format to an automated, secure system that can be accessed, maintained, and shared electronically. 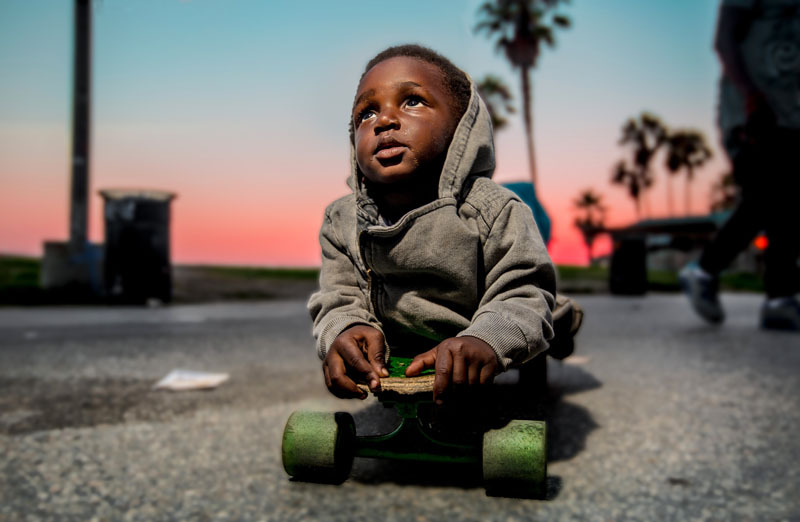 The groundbreaking public-private project, which The Children’s Partnership has supported since its inception, was led by the Ventura County Human Services Agency and received a strong endorsement from the Board of Supervisors last week. The Board described FHL as a huge step forward for foster kids in Ventura County.Antony Brennan, a foster parent from Ventura, said FHL is a time-saver for caregivers who previously had to piece together information about the children in their care from stacks of paper records. This ambitious project is a shining example of how government agencies can be innovators in the child welfare space and apply technology to find better solutions for the clients they serve. The launch of Foster Health Link is a clear sign of progress for children and youth in foster care in Ventura County, and indeed, a deserving cause for celebration. Read about Foster Health Link in the Ventura County Star. Check out Ventura County Foster Health Link. Learn more about the benefits of care coordination for children and youth in foster care. How Can California Expand Telehealth to Improve the Lives of Children with Special Health Care Needs? For most of his childhood, Ethan and his mother often had to drive six hours from their home in Redding, California, to Los Angeles to meet with a psychiatrist for his autism treatment. Today, Ethan, now 19 years old, drives just 10 minutes to a clinic in Redding where he meets with the very same psychiatrist via a live video conferencing system. Telehealth, using technology to provide health care and support services at a distance, has the potential to improve care for the 1.4 million children in California who, like Ethan, have special health care needs. These children often require multiple specialists, coordinated health care, and related services on an ongoing basis. In both rural and urban areas of the state, Children with Special Health Care Needs (CSHCN) often find their health care needs unmet for a variety of reasons, such as provider shortages, lack of access to specialists, lack of affordable transportation, and a number of other barriers. But with the increased use of video conferencing, remote patient monitoring through smartphones, and other technology applications, we can break down those barriers and make it possible for more children to get care they may otherwise go without, right in their own communities. Recognizing the potential of telehealth, The Children’s Partnership, the UC Davis Children’s Hospital, and the Center for Connected Health Policy, with support from the Lucile Packard Foundation for Children’s Health, set out to understand how telehealth is currently being used to meet the needs of California’s CSHCN and identify where policy constraints to wider adoption exist. After conducting a literature review, online surveys, and interviews with key stakeholders, including providers and California Children Services (CCS) administrators, we were able to uncover both the best practices of how telehealth is implemented and the difficulties in bringing it to scale. The majority of providers surveyed, namely pediatric physicians, thought telehealth has potential to bridge gaps in care for CSHCN, but over 50 percent felt that issues of time, reimbursement, and equipment limited its use. Of the 39 CCS program administrator respondents, 32 out of 39 would be interested in state-sponsored training to learn more about telehealth. It was clear from our interviews and surveys that many are eager for an expansion of telehealth that could help families get their children the care they need in a timely manner and at an affordable cost, regardless of where they live. CSS, health care providers, family advocates, children’s advocates, philanthropists, and other stakeholders all have a role to play to make telehealth for CSHCN a reliable option throughout California. Through expanded outreach to families and providers, and increased incentives for participation, we hope to have more success stories like Ethan’s, so instead of driving hours to multiple doctors’ appointments, children can spend their time reaching their potential.